Regional Context — Situated at the midpoint along the 1-20 corridor between Jackson and the Natchez trace, Twin Hills parks is ideal to facilitate a bicycle connection between the two. Twin Hills — One of the most important aspects of the site is the Twin Hills. As tall as fifty feet high the two hills feature, seven soccer fields, open green space for recreation, parking, terraces, shade and a great view of the Mississippi Basin Model. The two hills are connected by a pedestrian friendly catwalk, to create easy access between the two hills. This area of the site will be heavily occupied by the public. 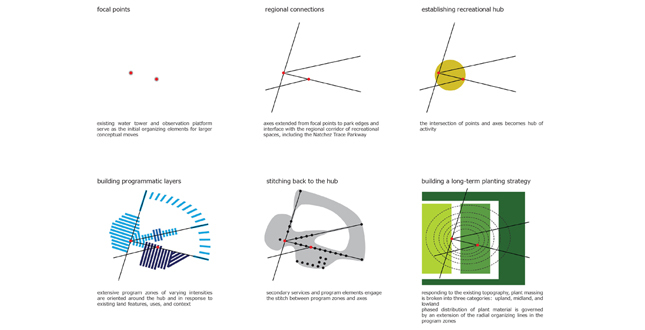 Basin Model Reuse and Relocations Strategy — Interaction with the basin model is encouraged by providing moveable platforms and walkways that move across the model as it exist today. The pieces of the model that have been reused are utilized as seating walls near the amphitheater and retaining walls along the twin hills. Model Integration Strategy — In our proposal, the existing model will be used in two ways. It will be used as it is today, a representation of the Mississippi River Basin, and it will be used as walls in other parts of the park. 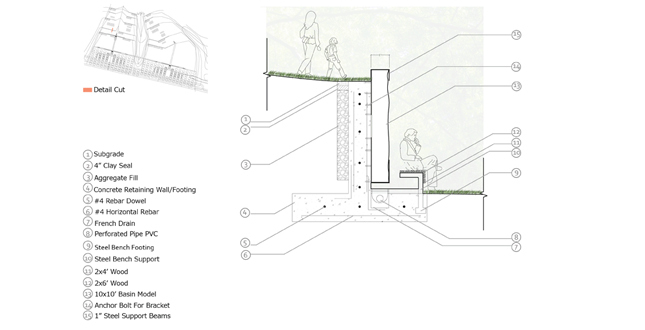 The walls will serve two purposes: retaining structures and play equipment for the children visiting the park. Trail System Breakdown — The trail system that travel throughout the park on established according to type creating a hierarchy based on use, there are three main levels: hiking, cycling, and mountain biking, capacity meters are placed along certain entry points to allow for user monitoring. Ecology — the site, which is in various ecological stages, lies between two major climax communities, one being the Jackson Prairie Belt and the other Gulf Coastal Plain. Building on the organization of the basin model, the planting strategy seeks to amplify through plant materials those regions — covered by the Mississippi River Basin, that of the uplands, midlands and lowlands areas. 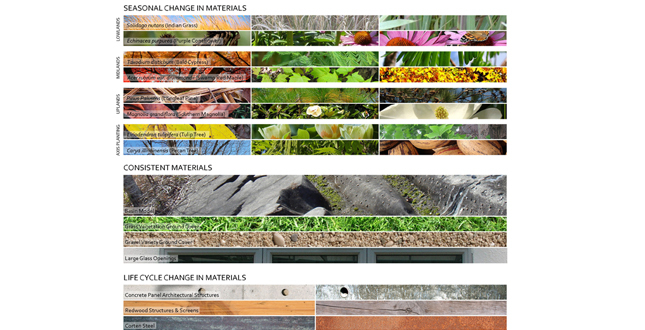 This strategy was addressed by using materials that could grow on site and had similar qualities to those that are living along the course of the Mississippi River. 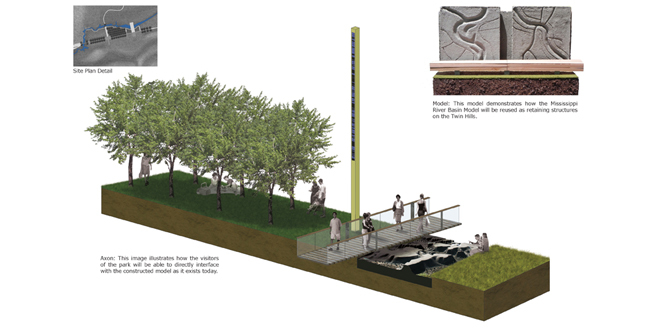 This large park proposal features an extremely unique and dynamic set of landscape conditions, as it hosts the nation's largest scaled hydraulic model of the Mississippi River Basin. 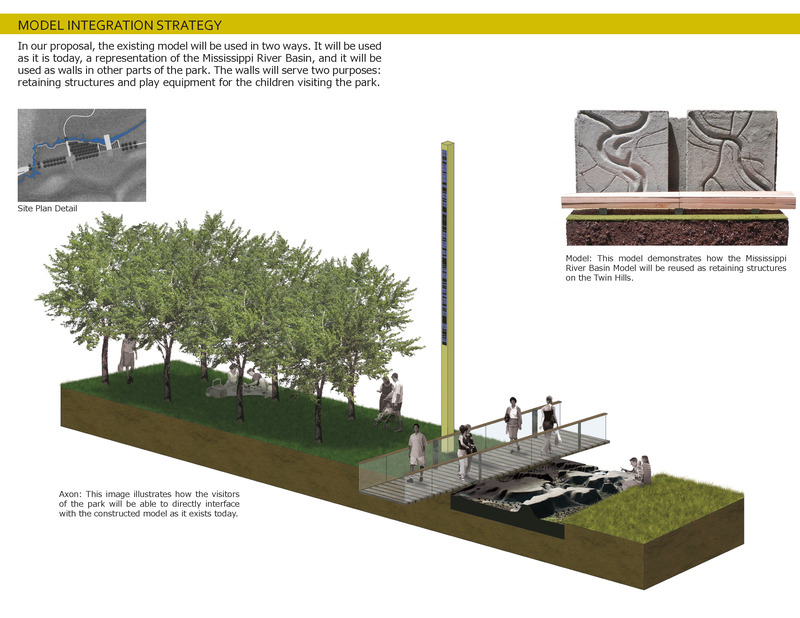 Through a complete restoration of the model, the park would become infused with various recreational opportunities. 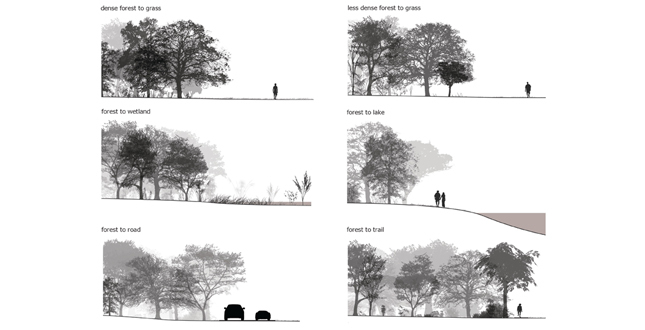 Not only will this park serve as a link between the Natchez Trace and the city of Jackson, Mississippi, it will serve to attract local visitors, regional visitors, and tourists interested in this exclusive piece of history. In 1944, the US Army Corps of Engineers began construction on the largest hydraulic model ever to be attempted. In an effort to gain control of the unwieldy and increasingly unpredictable Mississippi River, the Army Corps developed a 200-acre scale model of the entire basin, an area that covers 41% of the United States and stretches from Minnesota to the Gulf of Mexico. 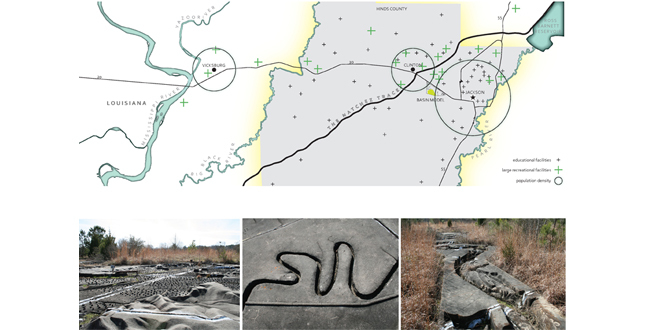 Sited in Clinton, Mississippi, ten miles from Natchez (and the real Mississippi River), the model enabled engineers to test, simulate and observe the effects of proposed flood control measures throughout the Basin. This was the first model to take on the river system in its entirety, a move that represented a major shift in the way the Army Corps sought to understand the alluvial landscapes. The river and all of its tributaries, spillways, levees, dams, and towns was reduced to 200-acre mini-landscape in which the Corps and various governing officials from around the Basin could gather and discuss the future of the Mississippi River Basin. The model was used to test for levee failure, breach points, and flood-prone land and was the primary testing facility from 1944 to 1986. 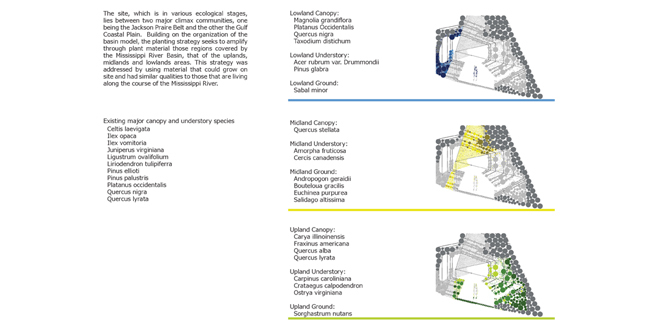 The basin model was constructed using a variety of different methods and materials, each aiming to simulate water flow in the actual river; the resulting model is a highly complex surface, creating a unique landscape that juxtaposes ‘the real' and ‘the simulated'. The model was officially decommissioned in 1990, abandoned, fenced off and left to decay. Eventually, the town of Clinton attached a loosely programmed park around the perimeter, one that neither responds to nor acknowledges the presence of the Basin Model. 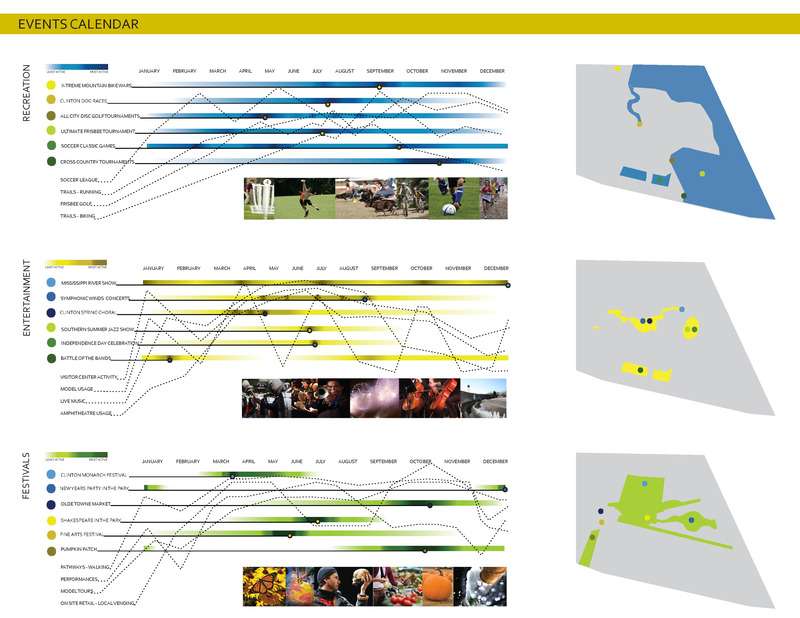 This site, with its existing register of recreational space and historical significance within the Mississippi River Basin, is positioned to generate a cultural node within a network of existing recreational spaces. Two miles to the west is the Natchez Trace and twenty miles to the east is the city of Jackson. Both offer substantial recreational draws, but are insolated within the cultural register of the region. 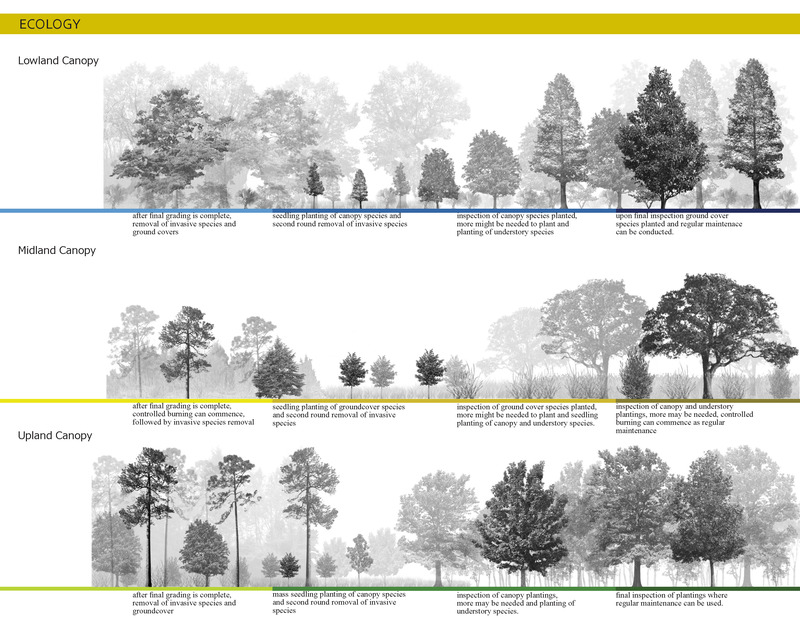 This proposal addresses the potential of this five hundred-acre park to establish a recreational infrastructure for the larger region, one capable of linking existing resources and establishing a new large park that services the entire state of Mississippi. The site has largely fallen into disrepair and is only currently being utilized as a light recreational space for the local Clinton community. However, contained within the park is a unique artifact: the nation's largest scaled hydraulic model. This occupiable relic, a leftover vestige from post-war construction, is a truly remarkable space, and, though largely masked by neglect, serves as the design focus for this large park. 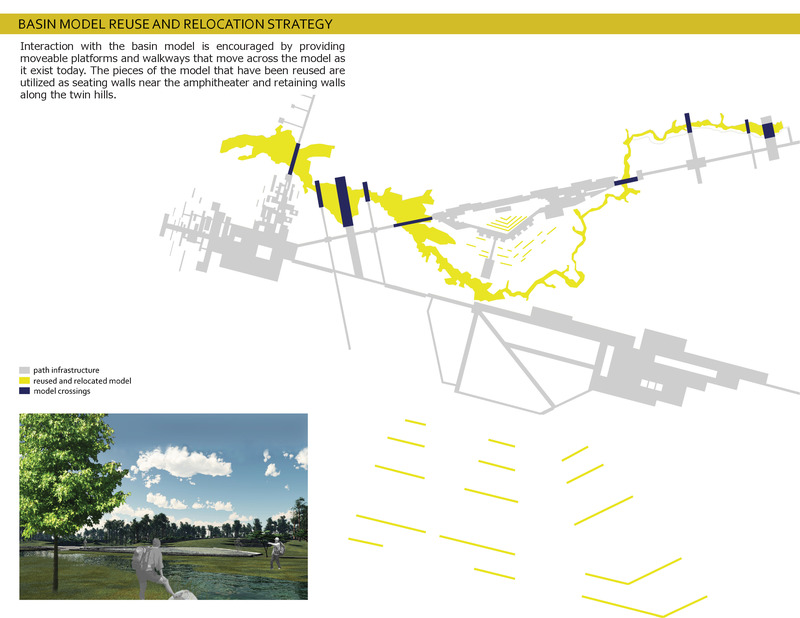 This proposal organizes program and circulation around the Basin Model, with three bands of space that transition from the southern, urban edge of the park with formal program pieces to the softer zones on the northern edges with trails and regional connection points. Loaded on the main access road are the heavily programmed recreation spaces, including sports fields and disc golf. 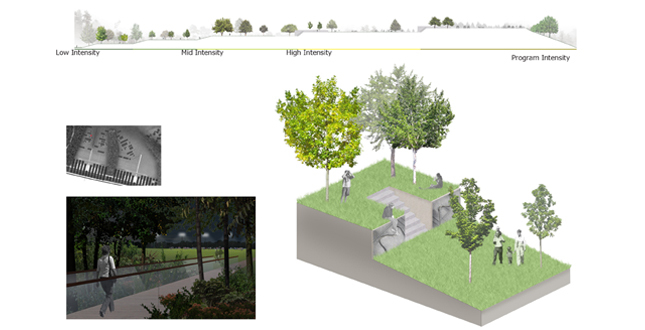 Running through the center of the park are a sequence of event spaces (plazas, amphitheater, visitors center, cafes) that are given focus by a section of the Basin Model that has been restored to working condition. The backside of the park is filled with a range of trails and light infrastructural support for cyclists, runners and naturalists, establishing direct connections to both local parks as well as the Natchez Trace Parkway. Within 15 minutes, a cyclist can move from the Mississippi River (real river) to the Basin Model (fake river), then into the cities of Clinton and Jackson. 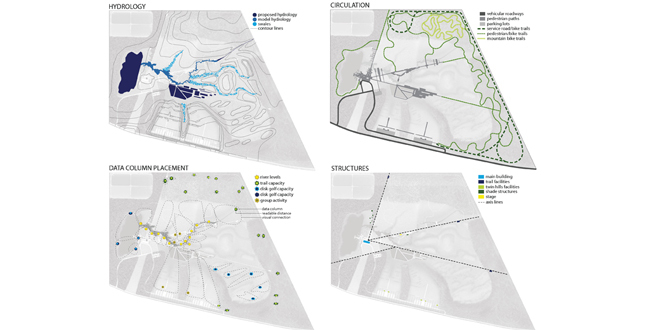 A 500-acre park serving both region and community requires program at a variety of scales and time cycles. 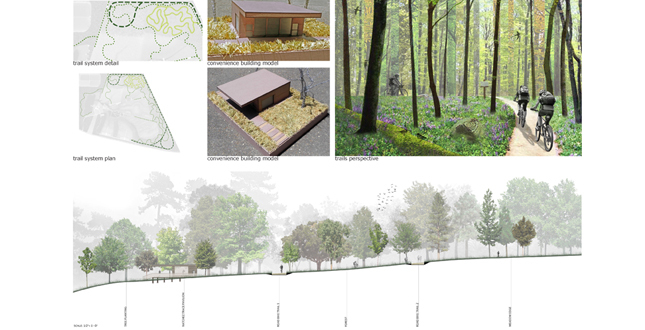 This proposal addresses local visitors, for whom this park will be an extension of their backyard, out-of-state tourists who will visit as part of a larger itinerary that includes historic and cultural sites throughout the region, hikers, cyclists, and bikers on the Natchez Trace who will see this park as a starting or ending point for their journey, and the urban dwellers of Jackson, for whom this park will be a destination to enjoy the area's major cultural and recreational events. The Mississippi River Basin Model has the capacity to draw a range of visitors, from those interested in this engineering marvel to those compelled by the landscape it creates. 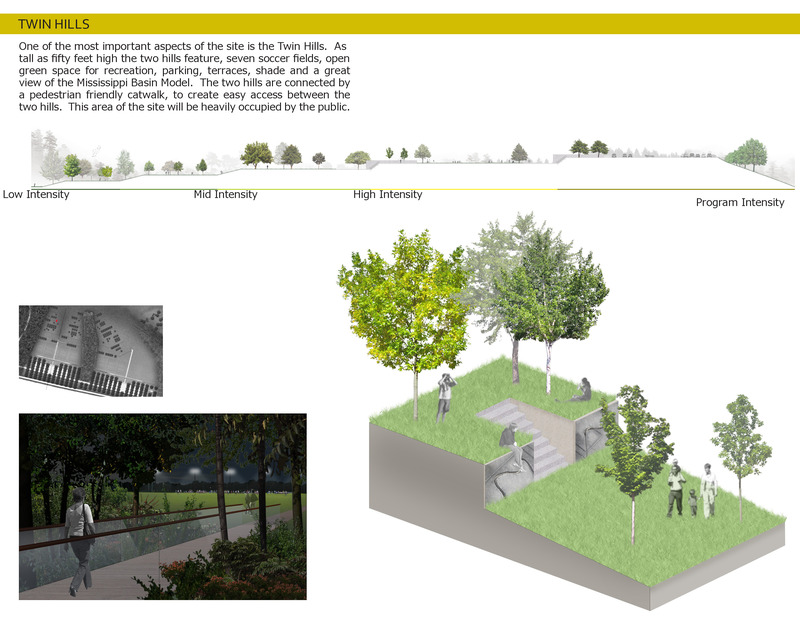 The model serves as the hydrologic and ecologic interface between maintenance zones within the park. 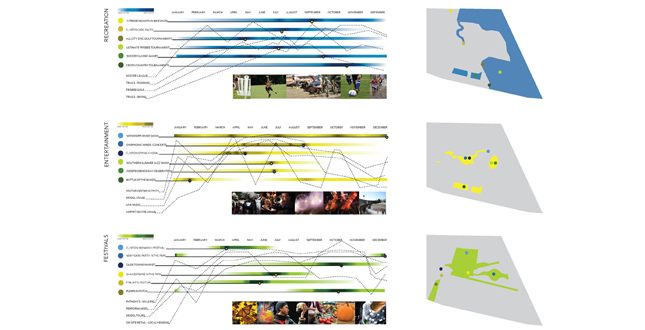 By amplifying the interface between the model and the surrounding spaces, the visitor can now occupy that liminal edge as a theater, an observation deck, an event space, a processional space, and a laboratory of water movement. 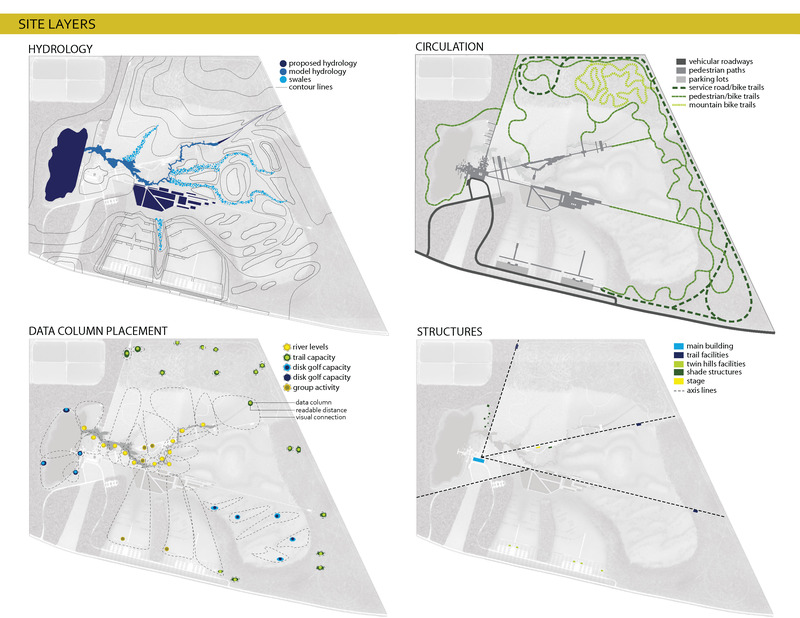 The infrastructure of the model extends into the site as an armature capable of organizing the program, planting, and maintenance strategies for the entire 500 acres. 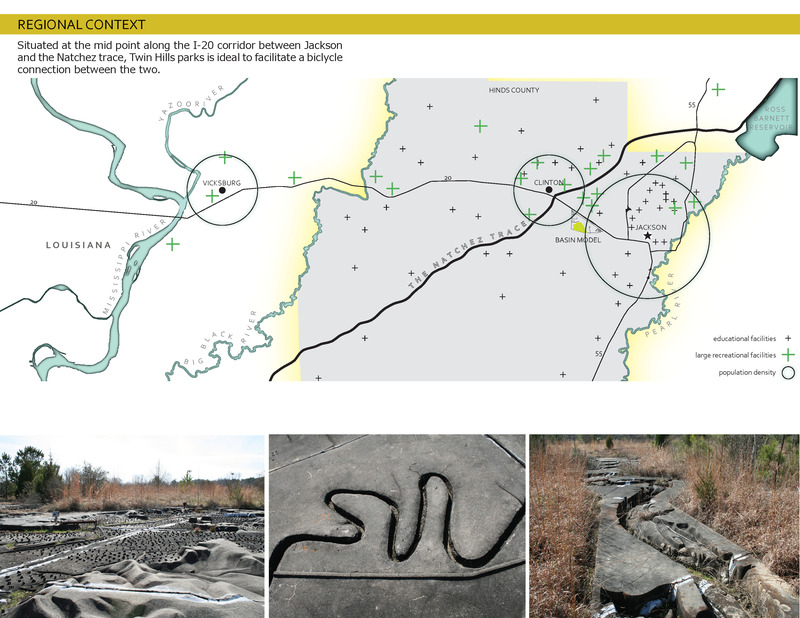 The site lies between two major climax communities (Jackson Prairie Belt and Gulf Coastal Plain). 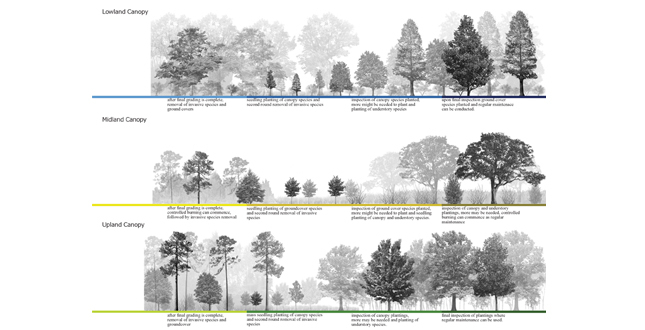 Existing canopy on site is mostly pine and other hardwood; the understory is largely dominated by invasive species. Building on the organization of the basin model, the planting strategy seeks to amplify through plant material those regions covered by the Mississippi River Basin. 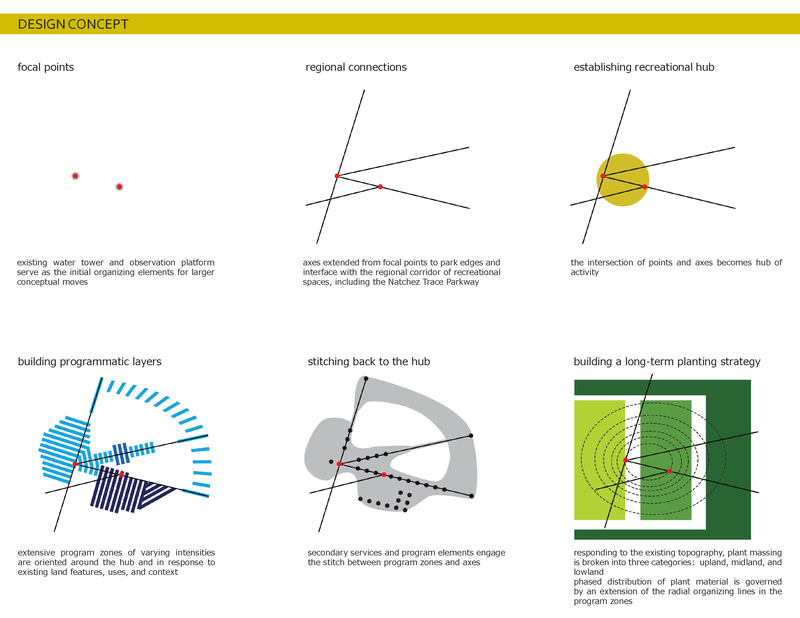 Pulling from three basic ecologies, the planting strategy deploys Upland, Midland, and Lowland plant typologies to correspond with programmatic zones in the park. 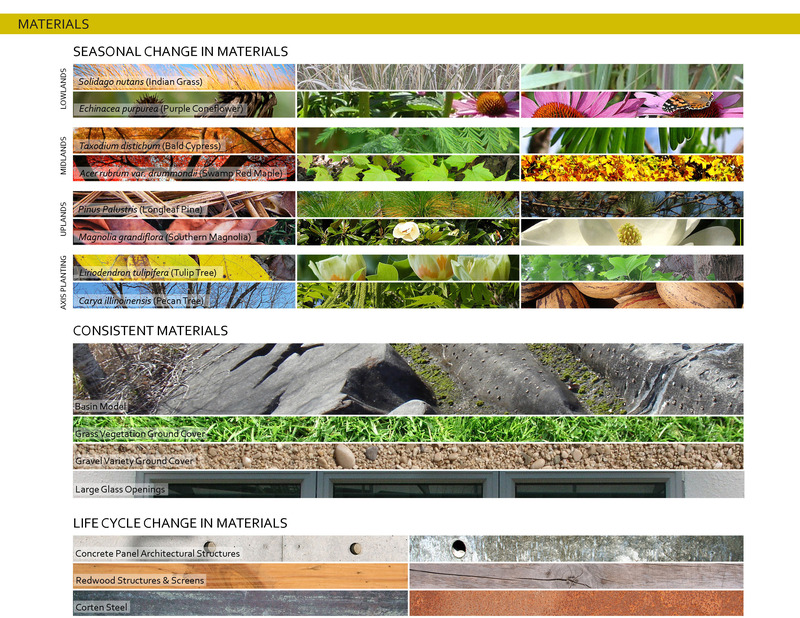 These ecologies are spaced throughout the site with a specific plant palette that offers a distinct spatial quality and materiality. 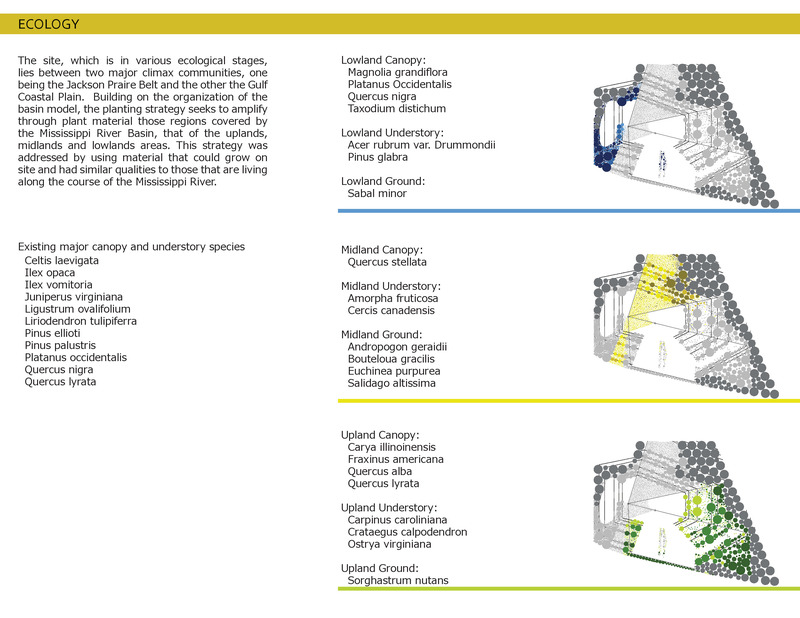 The midland ecology, taking up the largest amount of space in the park, takes advantage of the existing plant material on site wherever possible. 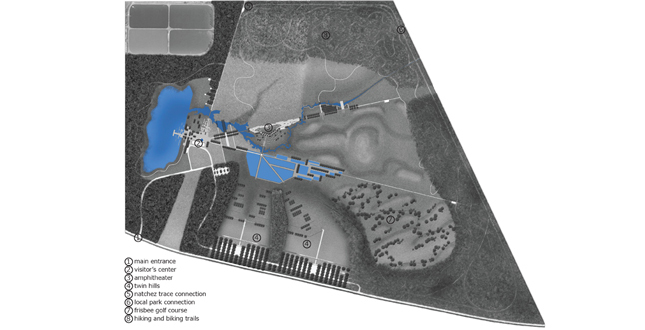 To make this park immediately accessible to its current local users, Phase One will be dominated by the construction of a pilot piece, the Twin Hills area, located along the main access road. 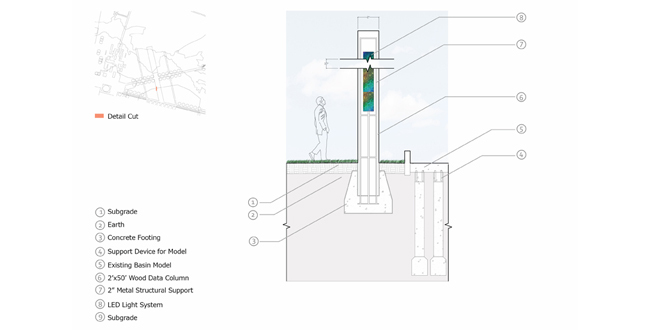 During that time, the restoration and renovation of the model will be underway. 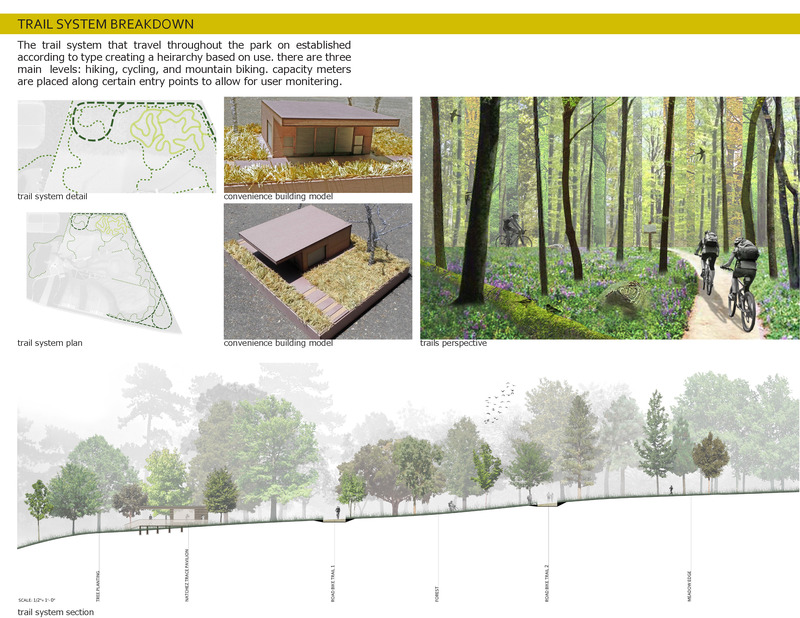 The edges of the park will be regarded to divert all drainage into the Basin Model. 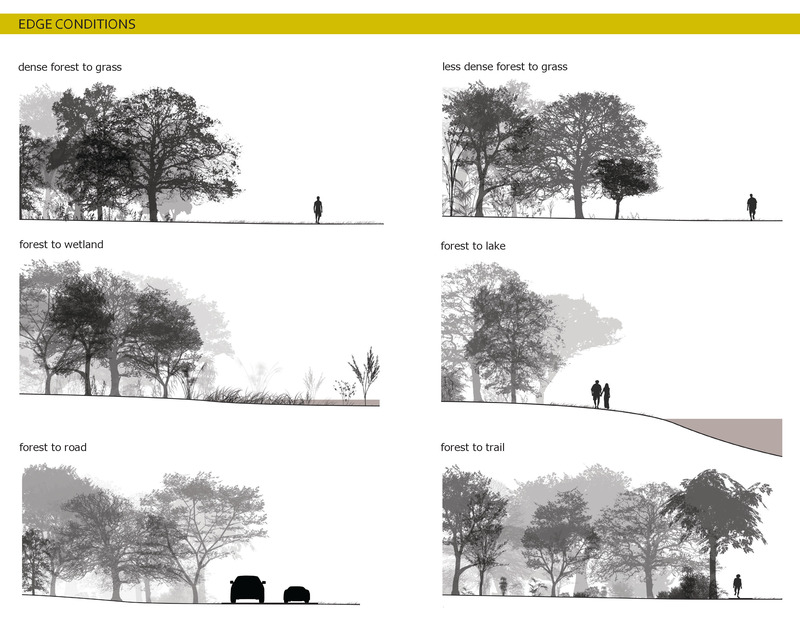 Phase Two will extend the recreational connections on the north end of the park to the Natchez Trace Parkway and local Clinton parks. 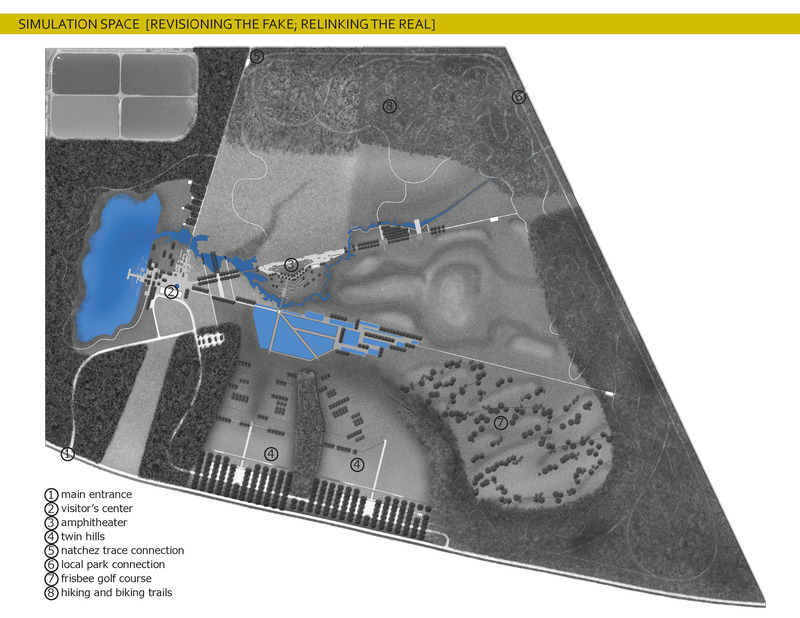 In Phase Three, the model will be reopened as the programmatic hub for the park with a full complement of adjacent event spaces. The history of this site as a testing ground for the Army Corps of Engineers has necessarily changed the face of this landscape from a natural habitat removed from the city to a highly manipulated landscape of simulation. 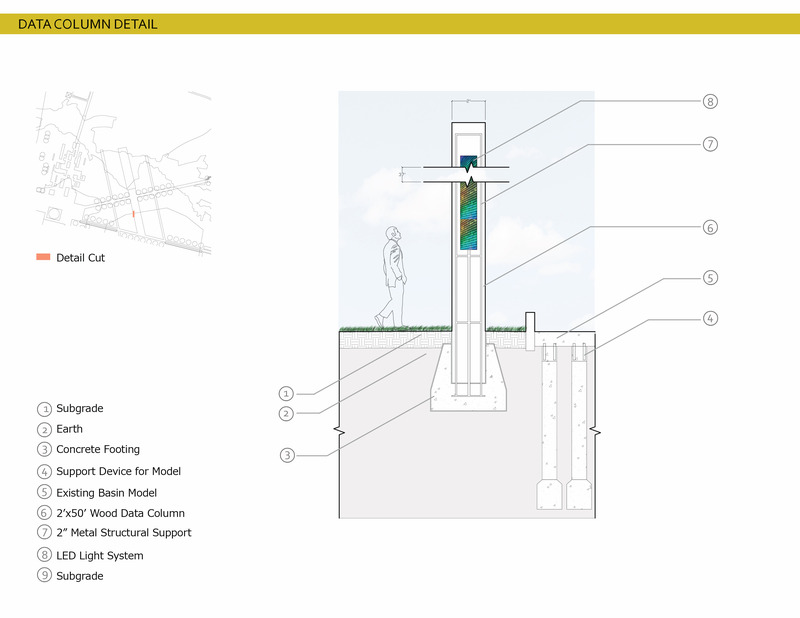 To that end, this design proposal utilizes the role played by simulation in the site's morphology. 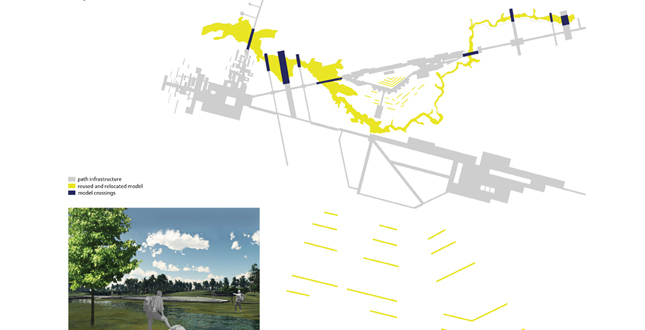 Seeking to amplify the experience of simulation, juxtaposing at several scales ‘the real' and ‘the fake,” the park promotes engagement with specific program spaces and with the site's history as a landscape device, ultimately speaking to a much larger and more complex system of space, water, and ground.